Keeping all of your social networks in sync isn’t always as simple as you would expect. Many people look at Twitter and Facebook as two different groups, and often choose to update each service with different information. There are times, however, when sharing the same updates in both places is desired. Seesmic makes it easy to manage multiple social networks at one time. Post Once: With Seesmic, you can update your Facebook and Twitter accounts simultaneously. You can also add a Ping.fm account to update other networks as well. 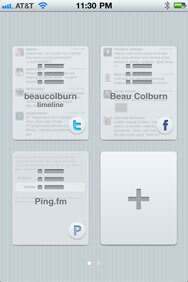 This nicely designed, straightforward app from Seesmic allows you to link your Twitter and Facebook accounts. You can also add a Ping.fm account, which can automatically update a wide variety of other networks such as Flickr, Tumblr, and Wordpress. Once the accounts are linked, you can post updates to each of the them individually or both at once, by just toggling a few buttons. When you first launch Seesmic, you need to log in and connect each account you want to access. Each account then gets its own “space,” which acts as an lightweight app for that service. You can reply, favorite, and retweet from the Twitter space, and you can “Like” and comment on items posted in your Facebook feed. You’ll get a more polished experience using a dedicated app for both Twitter and Facebook, but being able to read and interact with the social networks from within Seesmic is convenient. The real advantage appears when you want to post updates. By tapping the familiar new post icon in the top corner of either space, you’ll open an update window. By default, it will only post to the space that you are within, but you simply need to tap on the account name in the top menu bar, and a window will open allowing you to select a checkbox next to each account you updated. If you’re browsing Facebook and want to post an update that goes to Twitter as well, it’s only a tap clicks away. As with most Twitter clients, you can add photos, location information, and links to any updates. There are a number of ways to fully automate the process of linking your accounts, or to selectively use hashtags to choose which Twitter updates get posted Facebook, but I’ve never been totally comfortably with either of those options. Seesmic isn’t going to replace my favorite Twitter app, but it’s a handy option to have for the times that I want to share something in a few places at once.